I guess I should get used to this living in Wilmington! I know this is totally disgusting and looks like something you'd see in a medical journal, but its just mosquito bites. 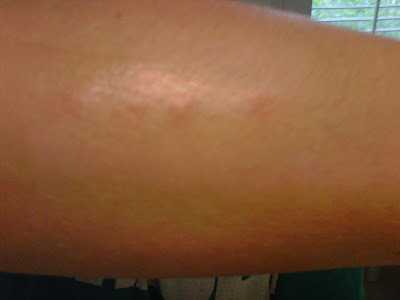 4 mosquito bites in a row actually...all about a cm apart. What are the chances of that happening? I am trying hard to resist the urge to play Guitar Hero on my forearm. WHAMMY BAR! !